The Greek Islands were the second destination on my new life as a globe trotter. I’ve made my home base the Island of Naxos while I hop around the surrounding islands. Island hopping is a very popular and fun thing to do over here. Don’t worry, I’ll be doing a blog post on the beautiful island of Naxos as well. 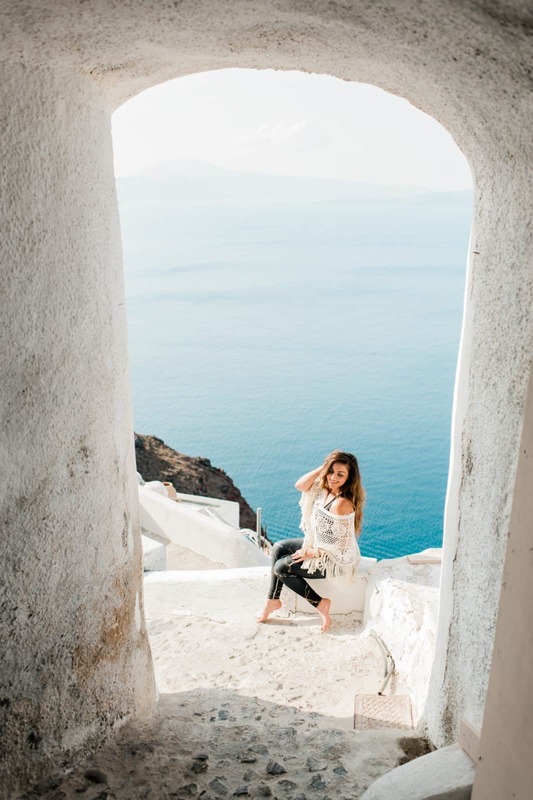 My first Island hopping destination was magical Santorini. You know those trips were everything is flowing and you feel the universe is in charge? Well that was this trip. This is the couples island and I was going alone but not to worry, the universe kept me in good company the entire time. The day before leaving for Santorini, I had a photo shoot with Stella, a photographer in Naxos. We discovered we were both going to Santorini the next day and decided to a photo shoot and girls night out. Stella has such an incredible vision and the synergy between us was pure magic. After Stella left, I had a sunset levitating photo shoot with Kristo. Yet again, the creative synergy and fun was at a 10 and we enjoyed a nice dinner together. Sometime s you just have to let go of everything you think should happen and embrace everything that is happening. Different from the other islands, Santorini is less about the beaches and more about the view of the Caldera. If you don’t know, a caldera is a large volcanic crater formed by a major eruption leading to the collapse of the mouth of the volcano. Oia, is the famous village in Santorini with the best views of the Caldera. I had the most amazing 2 night stay at Armeni Village in Oia. I stayed in suite 15 which had the most epic view of the Caldera. I went all around Oia and the view from my room was the best I’d seen. As you can see from my pic, this view embodies the essence of Santorini. My suite had 2 big beautiful bathrooms. One downstairs and upstairs. I love this because I hate sharing a bathroom…lol. Upstairs has 2 beautiful balconies. One balcony with a table to have breakfast and the other balcony has a big private hot tub with an area to sun bathe. There is also a beautiful big living room area and a sweet kitchen nook that has windows to the balcony. Waking up here is like waking up in heaven. Scenic magic everywhere you turn. The bedroom is big with a king size comfortable bed. I loved the the decor in this room. It is very retro chic with a vanity area to get ready. The hotel delivers breakfast on your terrace every morning and the fruits, bread and pastries are so incredibly fresh. The staff was so helpful with information about the island and things to see. Maria is the lovely woman that helped me and she if fabulous! I will definitely be staying at Armeni Village on my next trip to Santorini. Heaven is a place on earth, possible Santorini! In the winter Stella is based in Athens and in the summer travels around the islands for photo shoots. She also travels international as a destination photographer. 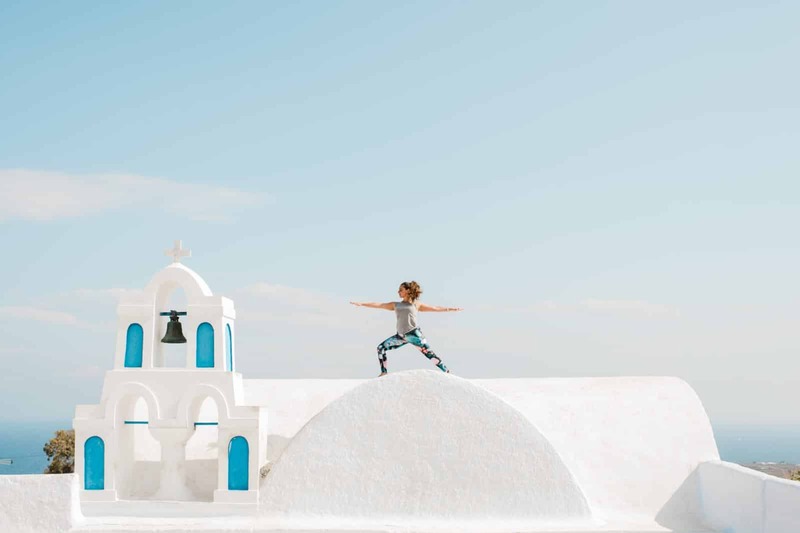 Kristo is based in Santorini and does epic levitating shots. He is also a destination photographer. This entry was posted in People & Blogs, Uncategorized and tagged activewear, confused girl in the city, confusedgirlla, crystal inspired swimsuits, female solo traveler, female travel blogger, greece, oia, santorini, solo in santorini, solo travel, travel blogger, travel swimsuits, yoga clothes, yoga gear, yoga pants, yoga shirt.